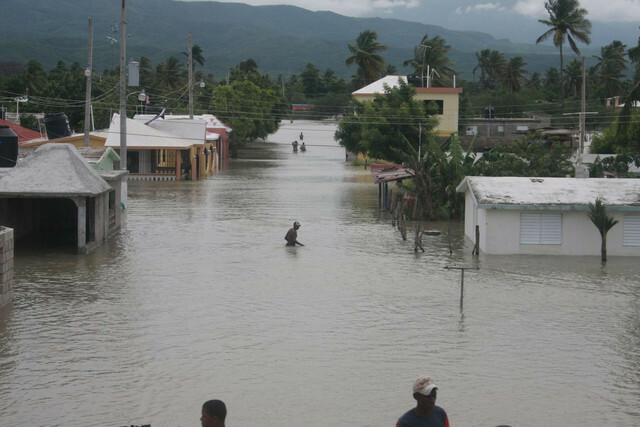 The Dominican Republic is facing a massive repair bill as torrential rains continue to wreak havoc across the country. At least eight of the country's 31 provinces are under a state of emergency declared by President Danilo Medina, as his government grapples to cope with the unfolding crisis. According to disaster official Jose Manuel Mendez, more than 20,000 people on the country's north coast have already been displaced, amid the heavy rains that have pounded the country for more than two weeks. "More than 130 rural towns in that region were cut off by heavy rains that destroyed 50 homes and severely damaged 62 others," he told the Associated Press. "No one should cross rivers by car, on foot, and much less swim across them." Thousands of people along the hard hit north coast have been evacuated, including 700 inmates in Santiago. The military also rescued more than a dozen people who were left stranded in Los Naranjos, in the north east of the country. Relief efforts were underway to dispatch emergency supplies to affected families, but were being hampered by the continuing rainfall. The National Office of Meteorology of the Dominican Republic has warned that the rain is likely to continue through to the weekend. "For tomorrow, another trough will be approaching the national territory, providing conditions to increase rainfall," it said in a statement. It also cautioned residents in living along rivers on hillsides to exercise caution and beware of flash floods and landslides. The flooding comes less than two months after the passage of Hurricane Matthew which resulted in minor damage.